The Mosque is located at 250m northeast of the Bir Barouta. It has one of the finest façades in Tunisia, though the interior is not open. 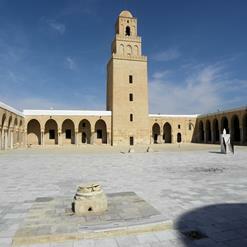 Mosque of the Three Doors was founded in 866 AD by Mohammad bin Kairoun el-Maafri. The Mosque is also known as Ibn Khayrun Mosque.